My Daughter LOVES pork and for her the idea of wrapping bacon around a pork roast was as exciting as a bucket of Halloween candy. 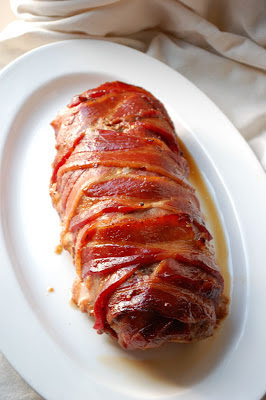 Wrap the pork loin in bacon. 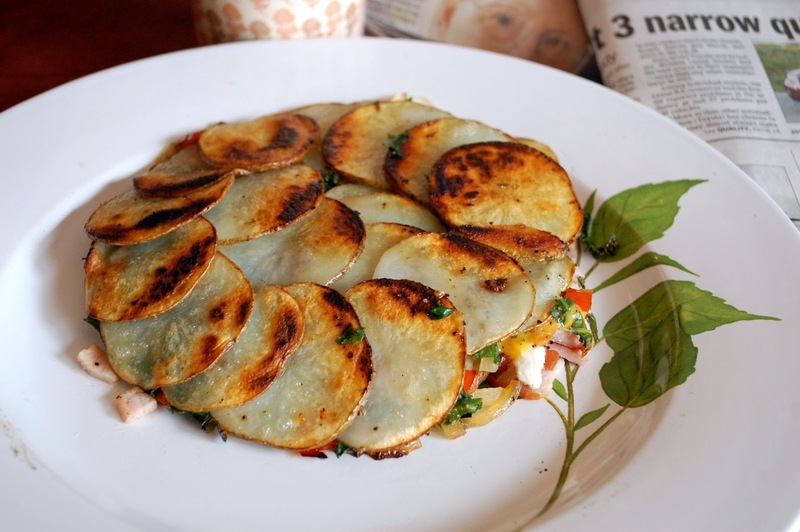 Place in an cast iron pan. Combine rest of ingredients in a small bowl; stir well. brush the sauce on the bacon wrapped loin and place in a preheated 375 degree oven. Bake until the pork loin reaches 150 degrees inside, basting with the sauce every 20 minutes or so. If the bacon starts to darken too quickly, tent the roast with tin foil. once the pork has reached an internal temperature of 150 degrees remove from oven and let rest for 15 to 20 minutes before slicing. I served this with roasted cauliflower and mashed potatoes. 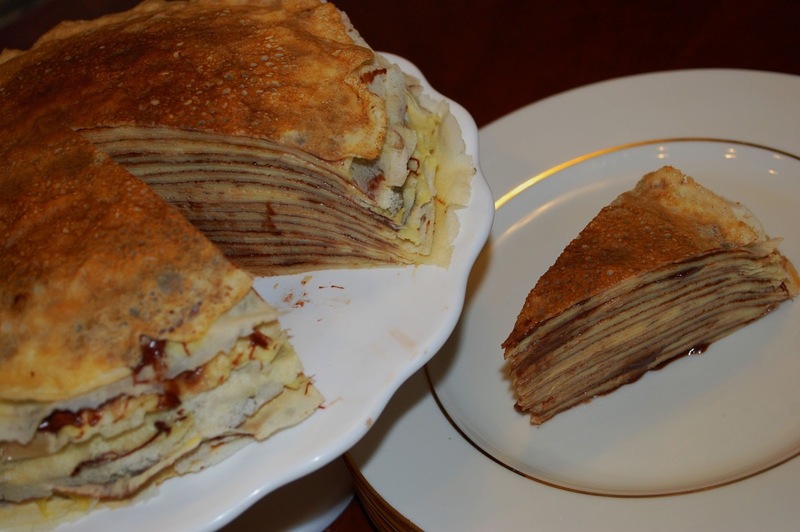 Crepe Cake Layered with Pastry Cream and Nutella. Seeds scraped from one vanilla bean - or 2 teaspoons vanilla extract. If you are using vanilla extract it is added when the cream is finished cooking. In a 3 quart saucepan combine the milk and vanilla bean seeds. Heat just below the boiling point (scalding). Using an electric mixer (with whisk attachment if available) beat the egg yolks and sugar in a large mixing bowl until they lighten in color. Stir in the cornstarch. Pour about 1/3 of the hot milk into the egg mixture (this is called tempering), whisking continuously to incorporate. Whisk the tempered egg mixture back into the remaining hot milk, and place the saucepan back on the heat. Cook on medium high heat, stirring constantly with the whisk, until the mixture comes to the boil. Reduce heat and boil for about 30 seconds, stirring constantly. Remove from heat and gently whisk in the butter. Strain the pastry cream into a bowl, place plastic wrap directly on the surface, and chill completely. 2. Make the crepes. this recipe 4 times. I would make 4 separate batches, for some reason the batter turns out better than if you just make 4 times the ingredients at once. add a little butter to a hot pan and pour in about 1/3 cup crepe batter and quickly tilt and rotate pan to cover the bottom in an even thin layer. cook for about 1 minute and turn and cook for another 30 seconds and remove. Continue until all the batter is gone. 3. Nutella that is in a bowl that will fit over a larger bowl filled with hot water to keep the Nutella soft so that it is easier to spread thinly onto the crepe. start by placing a pretty crepe to the side to top the cake, then set a crepe in the center of you cake place or what ever you chose to assemble you cake on. then spread a thin layer of pastry cream with an off set spatula. place another crepe on the previous cream covered crepe and then spread a thin layer of Nutella. Repeat alternating between pastry cream and Nutella until you have used all of your crepes being sure to top the cake with your pretty crepe you saved before. cover with plastic wrap and chill for at least 2 hours before serving.